Foynes Flyingboat Museum captures perfectly the romantic era of the first transatlantic passenger flights by flyingboat. Pan-Am Airlines commissioned Charles Lindbergh who had made the first solo flight to Europe in 1927, hot on the heels of Alcock and Brown who had beaten him to it in 1919, to find a suitable base for their flyingboat service from New York to Ireland. Foynes on the Shannon estuary was chosen as the nearest European landfall, which turned out to be of strategic importance as a back door into Europe during WW2. Like our own Maureen O’Hara who was married to dashing pilot Captain Charlie Blair who flew the last scheduled flying boat from Foynes to New York in 1945. Returning the next day in the first landplane a DC-4 to Rineanna, now Shannon International Airport just across the estuary. The history of Foynes, the centre of world aviation at the time, is colourfully depicted and recreated meticulously, down to the red fire buckets, in the Foynes Flyingboat Museum housed in the original terminal building. Irish Coffee , invented one night in 1942 ‘to warm’ up damp passengers. 1 Take the ferry from Tarbert to Killimer to explore West Clare, a 30 minute roll on roll off daytime service, weekend special €10 each way. 2 Vandaleur gardens visit these lovley old walled 'forgotten gardens' which once belonged to the Kilrush Estate, free admission, plant sale and freshly baked scones daily in the cafe. 3 Take a Cruise from Kilrush with Discover Dolphins who boast a 98% success rate of seeing dolphins and/or explore Scattery Island, a pocket history of Ireland from the Armada to the Vikings and World War 2. 4 The Foynes Inn wander down the street for a nice light lunch, Cathy doesnt have a menu, as everything is freshly cooked on the day depending on what's available. 5 Askeaton one of the oldest towns in Ireland, cross the medieval bridge to visit the Franciscan friary or Knights Templar castle. 6 Curragh Chase have a picnic here in the grounds of an old abandoned country estate, that was the home of the poet Aubrey de Vere once upon a time, it's now managed by Coillte, admission €5 per car. 7 Adare Village have a stroll around the prettiest village in Ireland. Rose covered, painted thatched cottages equaling endless photo opportunities. 8 Adare Manor stay at this luxurious 5 star castle and golf hotel, or at least have a gourmet lunch or afternoon tea in the drawingroom. If it's good enough for Tiger Woods & Catherine Zeta Jones? 9 The Mustard Seed dine out in this fabulous restaurant, renowned for its (own) garden fresh organic fruit & vegetables and locally sourced meat, fish and poultry. 10 Lough Gur not only very beautiful but a fascinating area spanning some 6000 years of history contains the largest Stone Circle, not just in Ireland but Western Europe and many neolithic monuments and castles. 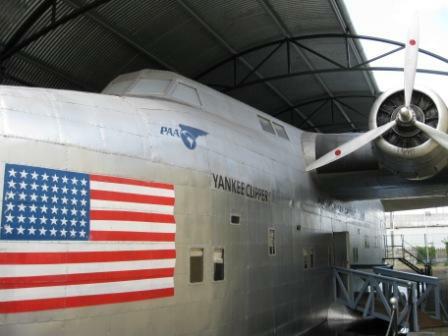 For more information Foynes Flyingboat Museum click here.